Sometimes I get ideas stuck in my head. Song lyrics, cravings, and recipes are the worst offenders. It's an itch that can only be scratched by listening to the same song over and over and over, or until I finally sink my teeth into whatever food I've been daydreaming about for days. This time, it was pineapple, peach, and paprika pie. This one was divisive. There were haters. A lot of people just didn't get it. Even my mom (on Twitter, none the less) chimed in and was like, "paprika? weird!" Harsh, mom, real harsh. It was time to bake my pie of the month. I knew it was going to be some sort stone fruit; California is insane, and we'd blown through rhubarb and most of berry season earlier in the year without me knowing (fruit here comes into season so much faster!). 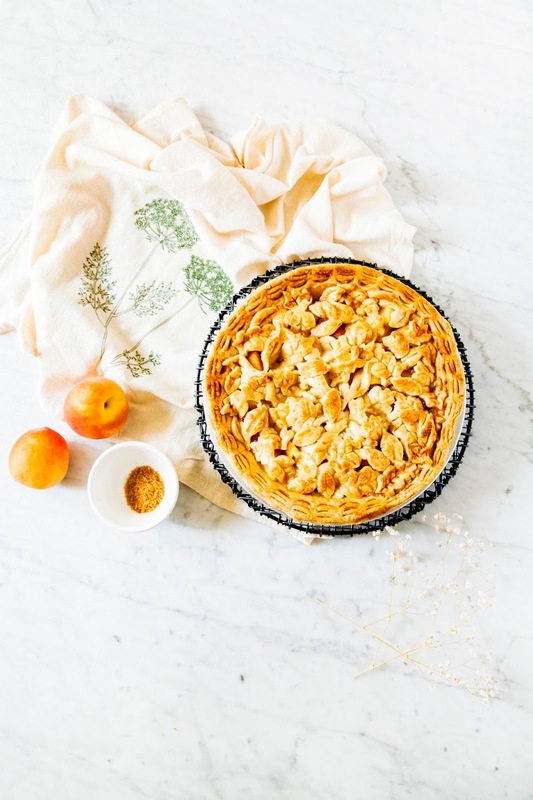 As I flipped through the Four & Twenty Blackbirds' Pie Book for stone fruit pie inspiration, one stuck out to me: peach and paprika. The book described the combination of sweetness from the peaches and the slight spicy, smoky flavor from the paprika as delicious. And I'll admit — like you guys, I wasn't a believer. But then I remembered those bags of pineapple and cayenne pepper they sell down the hill in the Mission District. Also, Molly was a supporter and reminded me of the dried chili pineapple from Trader Joe's. There was something about the contrast between those two flavors that made both these things an utterly addicting snack. I wondered if pineapple could also work with paprika, since pineapple and peach worked pretty well together just by themselves. And that's how this idea for pineapple, peach, and paprika pie got stuck in my head. In the end though, I got talked out of it. Snapchat rained its judgement down on me and I buckled at the knees. One anonymous Snapchatter snarled at me: "pineapple and peach are fine on their own; you're trying too hard!" But hey! At the end of the day, these recipes are for you guys. So I'm taking your advice and backing far, far away from the paprika. 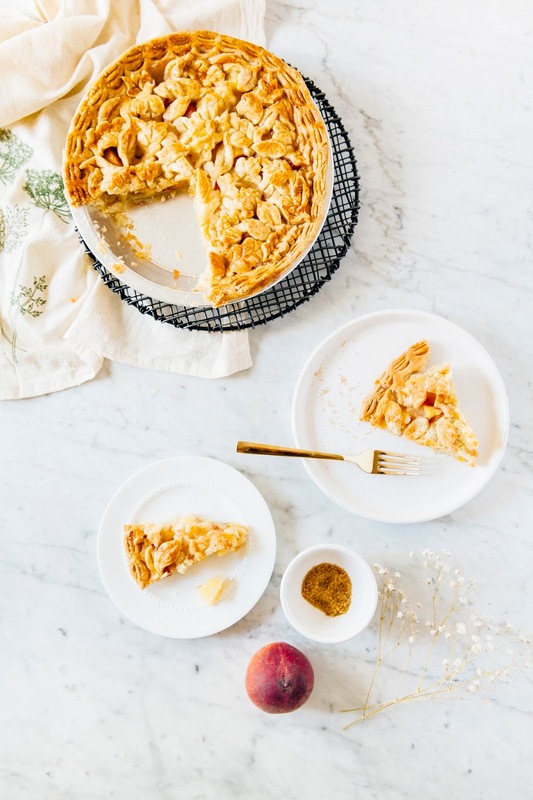 Nothing fancy or special in this pie, folks — just pineapple, peach, and brown sugar. Oh, and some coconut oil in the crust ti give it a little bit of a tropical flavor. And you know what? You all were right. It's delicious as it is. 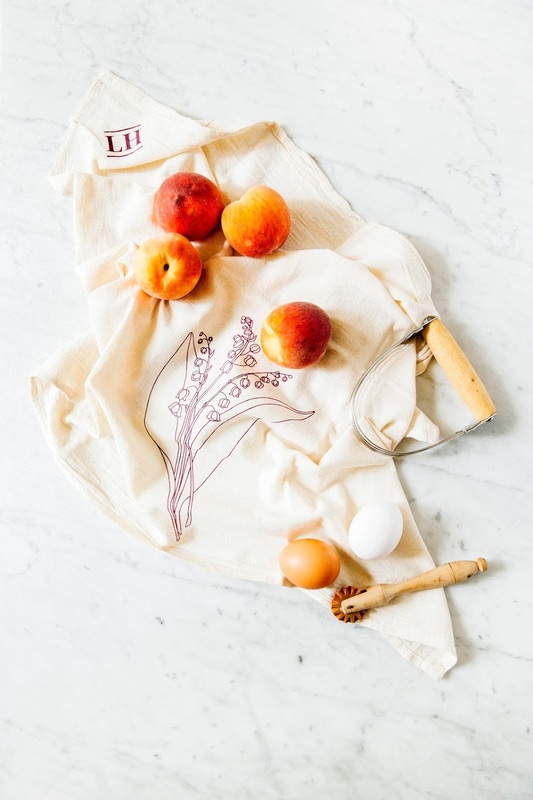 Thank you to Life and Home for sponsoring this post by providing the compensation and pretty flour sack towels that you see in this post! The towels are Life and Home's first product from their own line, designed in Brooklyn, and made in the U.S.A with all American materials. If you haven't checked out Life and Home yet, head on over — they have almost everything you could possibly need and want for a pretty and functional home. In addition to these floral towels, I'm in love with this coffee grinder, this ceramic KitchenAid mixing bowl, and this wooden muddler set for cocktails. I want it all! As always, thank you for supporting Hummingbird High and my awesome sponsors. I started my #pieamonth project to get better at making different types of pie; so far I've experimented with different methods for making pie crust (by blind-baking, by hand, by pastry blender, by food processor, etc) as well as different ingredients (all-butter, half-lard, etc). This time, I've decided to try using oil in the crust. This coconut oil pie crust was inspired by this vegan pie crust recipe from Food52; however, I threw in some butter for stability (I was worried that if I used all oil, the crust wouldn't hold its shape). The result was a dough that was as easy to work with as a lard pie crust, but with the richness of a butter crust and a little tropical flavor from the coconut oil. The only issue is that coconut oil tends to get melty fast when handled too much — be sure to keep the ingredients as cold as possible at all times for best results. 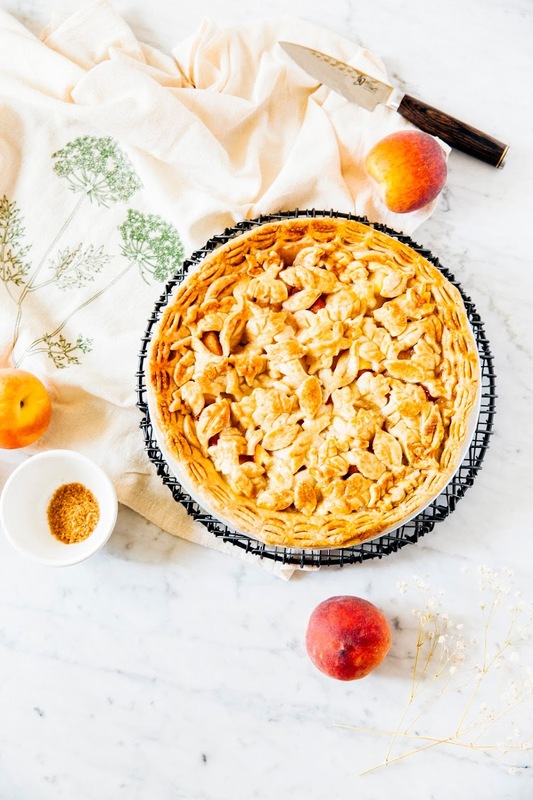 Check out this recipe for salty honey pie for even more pie baking tips! 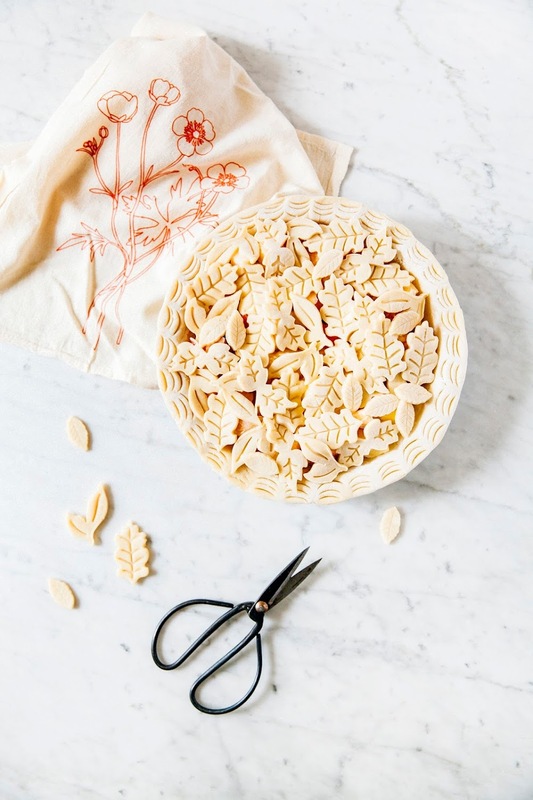 For the leaf crust design, I used these large leaf cookie cutter plungers (check them out in this pretty pear pie) and these smaller ones. Can't recommend them enough! Combine 1 cup water and 1/2 cup ice in a liquid measuring cup and give it a brief mix with a whisk or fork to combine the ingredients. Transfer to the refrigerator to chill and keep cold while you bring the dry ingredients together. In a medium bowl, whisk together 1 1/4 cups all-purpose flour, 1 teaspoon granulated sugar, and 1/2 teaspoon kosher salt until combined. Add 1/4 cup unsalted butter and 1/4 cup frozen coconut oil and coat with the flour mixture using your hands by gently tossing the mixture over the pieces (but don't actually touch the butter and coconut oil pieces themselves — you don't want them to get melty!). Working quickly, use a pastry blender to cut the butter and coconut oil into the flour mixture until mostly pea-sized pieces of the butter and lard remain. Remove the ice water mixture (from the 1st step) from the refrigerator and sprinkle 2 tablespoons of the ice water mixture over the flour mixture. Mix and cut in the water with the pastry blender until it is fully incorporated. Add more of the ice water mixture, 1 to 2 tablespoons at a time, and mix until the dough comes together in a ball with some dry bits remaining. Squeeze and pinch with your fingertips to bring all the dough together, sprinkling any dry bits with more small drops of ice water if necessary to combine. Be careful during this part — don't use too much water or you'll end up with a soggy pie crust and I'll cry for you! Use only the amount needed to bring the dough together into a ball; you'll likely only use about half of the ice water mixture, if that. Shape the dough into a flat disc, wrap in plastic, and refrigerate for at least 1 hour, preferably overnight before rolling and stamping. In a large bowl, combine 2 cups peaches, 1 cup pineapple, 1/4 cup dark brown sugar, 1/4 cup cornstarch, and a pinch of kosher salt. Toss ingredients together until the fruit is coated with cornstarch and sugar. Set aside. 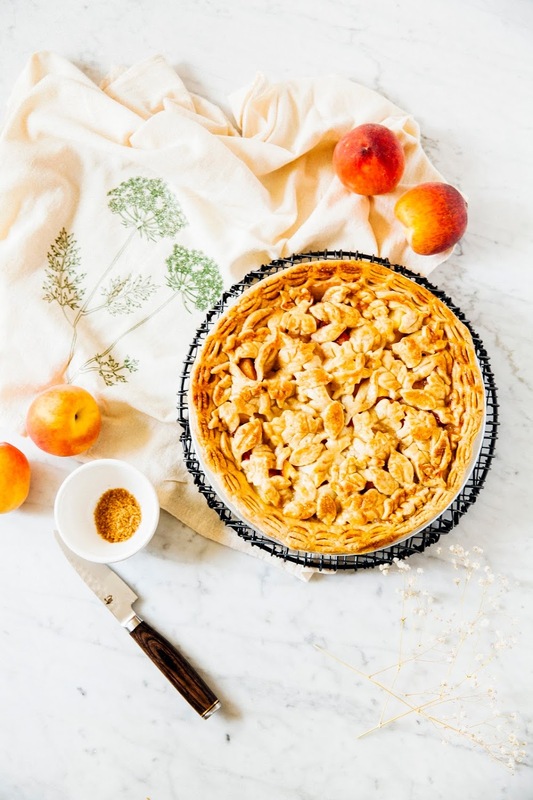 On a lightly floured surface, roll out the pie dough disk — if making a 9-inch pie, roll into a rough 12-inch circle about 1/8 to 1/4-inch thick. 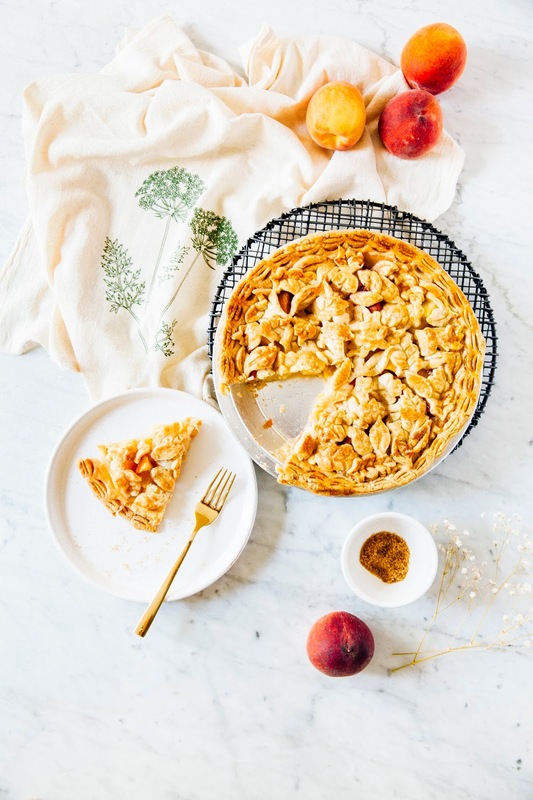 Transfer the circle to a pie pan and spoon the filling into the pie, using a spoon or the back of your hand to flatten the fruit across the pan and create an even layer. Use kitchen shears or a sharp knife to cut off any excess overhanging crust and use the ridge of a spoon to crimp a pattern onto the border of the crust. Transfer to the refrigerator to chill while you prepare the rest of the pie. If making a double-lidded pie, next, make the pie lid. Roll out the other disk into a 12-inch circle about 1/8 to 1/4-inch thick. If using cookie cutters to stamp out any shapes for your lid, this is the time to do it! If you want to go with a leaf motif like I did for my pie, I highly recommend investing in these leaf cookie cutters. If the lid starts to feel soft or sticky while you're doing this, transfer the lid to a sheet pan and freeze for 5 to 10 minutes until you've finished your pattern. Remove the refrigerated pie base containing the fruit from the refrigerator. Arrange your pie lid cutouts over the fruit. Transfer to the freezer to chill for at least 1 hour, but preferably overnight if you want your pie crust design to stay prominent during the baking process. When you're ready to bake the pie(s), center a rack in the oven and preheat to 350 (F). In a small bowl, whisk together 1 large egg to create the egg wash for your pie. Remove the chilled pie from the refrigerator and use a pastry brush to evenly brush the pie lid and crust with the egg wash; sprinkle 2 tablespoons demerara sugar over the egg wash.
Set the pie plate on a baking sheet and bake in the preheated oven for 1 hour, or until the crust has turned golden brown and the juices of the fruit filling are bubbling. Transfer to a wire rack to cool completely before slicing and serving.